Windows provides a number of ways to launch installed programs or features. There's the Start Menu, there's shortcuts on the Windows desktop, there's even the Windows Search and Run features. For many people, the facilities already available are quite sufficient. However, without organisation, the Programs section of the Start menu can become a very busy place. Programs have shortcuts placed in folders named after the program itself, or sometimes the publisher, or sometimes the category the program belongs in. If you're anything like me and you install programs a lot, you probably put the program you're installing in the default location and allow it to put a shortcut on the desktop and sometimes in the Quick Launch bar -- and once it becomes almost impossible to see your wallpaper for icons, you start deleting shortcuts you don't often use or dump them in folders on the desktop, or some other location and, over time, the natural entropy of the Universe and your own need to do stuff WITH your computer rather than spend time organising it conspire to make you wish for an easier way. 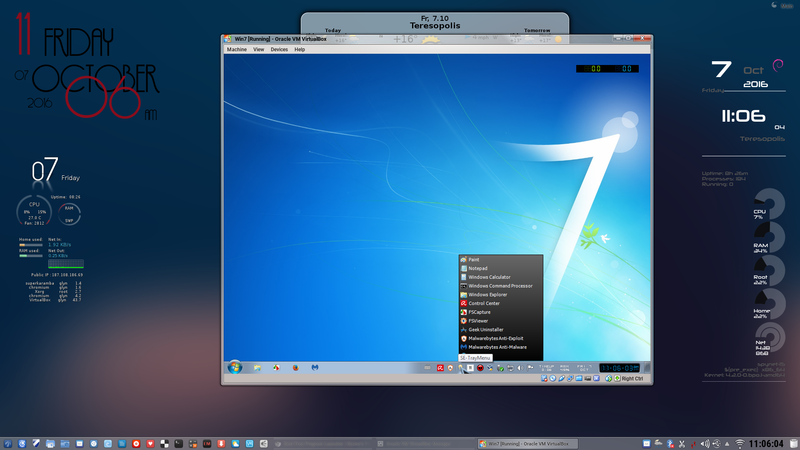 Program Launchers try to provide a more efficient way to work. Some try to help you find the program you want to run but can't find the shortcut for; some help you impose order on your system by giving you organisational tools that supercharge the facilities you have, or replace them entirely. The approach adopted varies from product to product and ranges from dockable windows to tray icons through to keyword typing. There's no "best" approach -- what works for me might not work for you, and your next door neighbour may very well have different needs again. In my case, I use products from two different categories: I use a keyword launcher when I know exactly what I want to run, and a Start menu replacement when I know I want to run one of the programs I have in a particular category but can't remember what it's called -- or want to think about different approaches or options that I may not have considered for a given task. Because of the sheer variety of possible approaches, you may well find that nothing presented here is perfect for you. If, for instance, you like the visual appeal of a dock-type approach but just can't find one that you're comfortable with, it can often be worth parking the idea and trying another approach entirely. Even if the alternative approaches also don't quite work for you, I often find that a way of working championed by one program can be used in another and suddenly a hybrid approach becomes the perfect way to work! So although it can be said that each approach and product has its strengths and weaknesses, you may find that many alleged weaknesses are irrelevant and that some trumpeted strengths don't do anything helpful for you at all. An open-source and cross-platform launcher that's simple to understand, configure, use and extend. Some glitches since version 2. A free floating command line utility for Windows gives you instant access to any program or website with MagicWords. Tiny footprint, simple interface, unobtrusive, easy to work with, mature and well supported. Requires customisation beyond the basic, so not ideal for everyone. A free portable launcher shines in many key areas like footprint and functionalities. Top in many key areas like footprint and functionalities. Organizes your shortcuts and icons with categories on the desktop. Shortcuts management with categories organization. A replacement for traditional Windows' Quick Launch panel and Start menu. Easy to use, with grouping, drag and drop, bundles, tray support, etc. A good replacement for the standard Quick Launch Bar, with added features such as grouping of shortcuts. Replacement for the standard Quick Launch Bar; grouping of shortcuts. Offers you quick access to categorized Start Menu shortcuts, recently launched programs and system commands. Quick access to categorized shortcuts, recently launched programs and system commands. LaunchBar Commander - it's by the same author as FARR but takes a hybrid approach, between docks and menus, being able to do both with equal facility. Finally, the docks class. These tend to be graphically interesting, often featuring a configurable background shape on which appears icons for applications, documents, shortcuts or controls. They can usually be persuaded to stick themselves to a screen edge or some other location. They're often a bit like toolbars, but prettier. I have to admit I'm not an enthusiast of these type of launchers, so my tests may be limited by my lack of imagination or insight into their good points. Two specific programs of this type are worth a look. An alpha-blended program launcher with good options for visual style, behaviour and docking position. Nice clean interface, easy to drop shortcuts for easy access and organization, portable. A circular dock launcher appears anywhere you like on the desktop. Appears anywhere you like on the desktop, just draw a circle by mouse. No ability to distinguish between different pages of icons. This category is maintained by volunteer editor oblivion. Registered members can contact the editor with any comments or suggestions they might have by clicking here. Possibly a bit complex for the average user, particularly when it comes to customisation. Lots in common with FARR. Open source is a good thing. Probably worth a look. I really cant understand why Executor is not on this list. Even if the last update was on 9 nov. 2013, IMHO it is the best launcher so far. I cant imagine my PC without Executor. I had it from windows 7 up to now (win 10) without any problems - running smoothly like a charm. It is enough just to look at the web site, to see that sky is a limit for this peace of software. I tried out the Find and run robot, Launchy and SlickRun (all on win7) but Executor was the fastest, and with much more options than all of them. It is good for newbies but also for the experienced users. And it is completely free! If you try it, you wouldnt be disappointed. I also tried all the ones you mentioned. And indeed Executor is a good one. Good enough to be mentioned here indeed. But then I found KeyPirinha and I found that one even better. Since that day I use it one all my computers. But it seems this page's editor is not willing to mention it here. Keypirinha is now available on both 32-bit and 64-bit platforms. Time to give it a second chance/look and give it a place in this list. It definitely deserves it. Remark: Is it intentionally that 5 programs get the "Gizmo's Freeware award as the best product in its class!"? Thank you for pointing this out. These items have now been corrected. MC - Site Manager. I have two machines, a laptop and a desktop, both with Win 7. Launchy 2.5 works fine on my laptop, but not on my desktop. I was able to download the 2.1.2 version, and it works fine. Actually, the best solution I've found is already built into Windows. You can very easily create your own new menu with sub-menus on the right side of the task bar. b) Copy shortcut files into it. You can have sub-folders with shortcuts too. c) Right-click on the task bar > Toolbars > New Toolbar... It asks for a folder, give it the folder you've created. Now you have a new menu on the right side of the task bar. The name of the menu is the same as the folder name, and sub-folders are shown as sub-menus. You can create any hierarchy you like of links and sub-menus, and reorder them by dragging. Simple and effective. I've been using this for years and it works well for me. You can also, of course, reorganise the programs area of the Start Menu using similar techniques. Where launchers come into their own is where they provide extra functionality (or chrome!) and/or make (re)organisation of your shortcuts either easier or unnecessary. There are almost always alternatives to the features Microsoft provide, but if you can meet your own needs without exploring different solutions, nobody's going to force you to do anything different! I've tried various launchers over the years - I even wrote my own launcher about 20 years ago, which optionally moved recently used files and apps to the top - but they do nothing for me. Creating a custom Windows taskbar menu is far better than the Start menu, because you can put exactly what you want, where you want, with no fuss, and you don't get assorted junk appearing. Windows leaves it alone. Combine this with the Everything Search Engine, and you don't need the Start menu at all. In fact, I rarely ever use the Start menu on my development machine. Since I use portable apps as much as possible, and I keep my custom menu folder in the same location as my portable apps, my menu is also portable. Mm. Looks a tiny bit complex for normal users but also looks like one to watch, particularly for more advanced users. Thanks! Apparently the home page of Enso (http://www.humanized.com/enso/launcher/) doesn't exist anymore. Recently I've been using a launcher app I found... Quick Access Popup. http://www.quickaccesspopup.com/ which uses the Start-W combination to pop up a menu you build. It's pretty feature rich and freeware. It does pop up a "support freeware" reminder on occasion with many options to show your support. Surprisingly it's written an "AHK" - Any Hot Key scripting language! I recommend it. I like QAP. It looks very similar than the app I use for years now, Quick Cliq. I will use them now side by side to make a comparison. I prefer the mouse-shortcut of Quick Cliq (right click + move down) because with QAP I had to put Chrome in the exlusion window because I use the wheel click all the time to open a link in another tab. So far I don't see many differences but I will try QAP for a while §to find out. Thanks for mentioning it. I tried both Quick Cliq and QAP a few days now and I must say they are very simular. I use Quick Cliq a few years now and I come to the conclusion QAP doesn't add anything for me (it's not less either) so i will keep using it. I don't have any problem with his use of the hotkeys (I'm a mouseman myself and make little use of them) but i know that you can alter them in the settings. You can even disable them so this is no issue for me. I'd say it's a pretty extensive menu that only takes up about 3/4 of the height of the screen. I use SE-TrayMenu (install or portable). Not much info on the developers site unless I'm missing it but it doesn't appear to be Win '10 supported although that doesn't mean it won't run. I don't use Windows 10 so this screenshot is from my VBox Windows 7 system on Linux. Different appearance settings are included and you can have a more narrow display if preferred by shortening the launcher text entries. MC - Site Manager. Can SE-TrayMenu have sub folders like BobTSS ? In addition to files and applications you can add folders and sub folders, but only individually. MC - Site Manager.